Lambert Grimaldi was born in 1420 into the branch of the Grimaldi family that ruled Antibes. Fairly late in his life by the standards of the time he was chosen to marry Claudine, daughter of Lord Catalan, of the Monaco branch of the Grimaldi dynasty in order to keep power consolidated in the family. He had already fought in defense of Monaco before and had to deal with intrigues on the part of the regent of Monaco and his future grandmother-in-law Pomelline. However, in 1465 he and his cousin Claudine were married despite the fact that she was no more than 14 at the time and he was 45. She abdicated her powers to her husband and Lambert became officially Seigneur de Monaco and was recognized as such by King Rene of Anjou and the ruling Sforza family of Milan in 1458. Were it not for the age of his bride they would surely have been married sooner so it was that the political arrangements actually preceded the wedding ceremony. Lord Lambert of Monaco has a rather colorful history. Remembered as a great diplomat, this was explained in a less than flattering description which judged him, “Self-centered, cold, patient, contemptuous of the glories of battle, he preferred to rely on his diplomatic skills”. That is according to the early historian Gustave Saige who nonetheless also attributed to him great tenacity and composure in times of crisis. Somewhat more recent historians have shown from his correspondence that he was a very learned man and a sincerely religious man who considered a vocation in the Church. Yet, keeping a cool head in a crisis did not hurt as there were plenty of those to deal with, starting with his still-persistent grandmother-in-law Pomelline. The formidable Pomelline had dispatched galleys and soldiers from Catalonia and Aragon to raid Monaco. They fought their way into the harbor at the Port of Hercules, burned the Monegasque ships, burned houses, vineyards and nearby croplands. Yet, Lambert eventually fought them off and saw them return to Spain. Then his own cousin Lascaris launched an attack on Monaco, which was repelled, and rebellions broke out in Menton and Roquebrune which had to be put down. Through it all the crusty, old aristocrat never wavered in his defense of Monegasque independence and survived every such catastrophe. He also improved the defenses of the country, put a permanent garrison of 400 troops in the fortification on The Rock and kept several galleys on hand ready for sea at a moment’s notice. 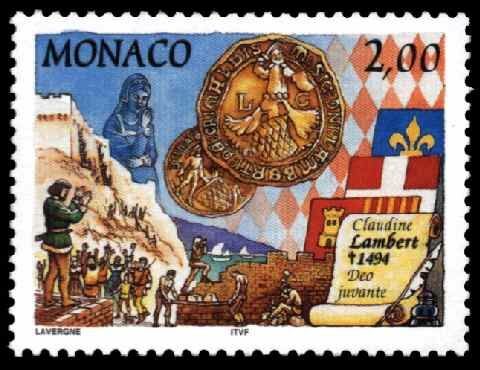 What is just as remarkable is that, in spite of all of these military expenditures, the frugal Lord Lambert was still able to turn a profit due to his success as a businessman and he would leave his successors on the throne of Monaco a considerable treasury that would prove invaluable as they advanced themselves in the world. Still, ever since Lord Catalan had revoked the treaty with the Duke of Savoy, Monaco had been without a royal protector and for long-term stability Lambert had to remedy this. The most natural choice was France and Lambert dispatched his brother, Bishop Jean-Andre of Grasse, to begin negotiations with King Louis XI. When the French monarch was less than receptive Lambert displayed his patience and when Louis XI was succeeded by King Charles VIII he tried again. This time things went much better as Lambert had strengthened his hand by marrying his son Jean to Antoinette of Savoie with the approval of the French court. Not only did King Charles VIII agree to become protector of the Seigneur de Monaco in a formal document of February 25, 1489 but he also named Lambert a counselor and chamberlain to the King of France. More importantly for Monaco, the official document did not require Seigneur Lambert to submit totally to the French king as his liege lord nor did Charles VIII claim any rights or authority over Monaco itself. Effectively, Monaco had become a protectorate before the term existed and secured support and recognition for her status as an independent, sovereign country. With the backing of the French King secured, Lambert felt safe enough to inform the Duke of Milan and the Doge of Genoa that Monaco no longer had anything to do with either of them. With that achievement sealing the deal, it can safely be said that the reign of Lord Lambert of Monaco was a resounding success. He died on March 15, 1494 in Menton after 37 years on the Monegasque throne. He had defended Monaco from the Spanish, dissidents of his own family, enemies without and rebels within. He had secured the protection of the Kingdom of France as a guarantee against the constant wars of the Italian states and he had been given recognition of the independence of Monaco as a sovereign state. It is thus fitting, and a sign of humility and piety on his part, that it was Seigneur Lambert who gave the House of Grimaldi of Monaco their official motto; Deo Juvante, ‘with God’s help’.